Security may be referred to freedom from potential harm from external forces. There are many beneficiaries of security that may be social groups and persons, institutions and objects, ecosystems, and any other entity that is known to be vulnerable to some unwanted change in its environment. The security context may refer to the relationships between a security referent and its environment. Both security and insecurity may depend, first of all, on whether the environment is hostile or beneficial to the referent and how capable is the referent of responding to their environment in order to thrive or to survive. “Security” term can be also used to refer to acts and systems whose purpose may be to provide security. Such systems may be the security forces, cyber security systems, security cameras, security alarms, and others. All these devices can be mentioned within one drawing in case you decide to create a building plan mentioning all the existing security equipment. Such security plan, as well as any needed access plan, can be created in the ConceptDraw DIAGRAM diagramming and drawing software by using the Security and Access Plans solution. The security alarm systems are incredibly common today and widely used in residential, industrial, commercial, military, and other buildings and territories. All they serve for a single purpose of detecting intrusions and unauthorized entries, protection against the burglaries, thefts and damages that can be inflicted by the intruders, they allow quickly react on these accidents, as well as on the situations caused by the natural disasters, fire, smoke, etc. The Security and Access Plans solution may be utilized in order to develop detailed equipment and cabling layout plans, blueprints, and wiring diagrams on internal and external security and access control systems, video surveillance and closed-circuit television (CCTV) systems. Use it to design security chart, physical security plan, access chart, or access scheme in minutes. It can be useful for many IT specialists who want to make sure that the equipment they leave in the office is safe and protected enough, placing the cameras and other monitoring tools all over the building. Also, the security managers, as well as other guards, may find it convenient to use the Security and Access Plans solution in order to create the security plans and access plans they can rely upon. There are 3 stencil libraries containing 104 vector objects for design physical security plans. The vector stencils library Video surveillance contains 15 symbols of electronic closed-circuit television (CCTV) equipment, digital video cameras and recording devices, covert video equipment for drawing the layout plans of security and access control systems, video surveillance and security control monitoring systems. There are a few samples that you see on this page which were created in the ConceptDraw DIAGRAM application by using the Security and Access Plans solution. Some of the solution's capabilities as well as the professional results which you can achieve are all demonstrated here on this page. All source documents are vector graphic documents which are always available for modifying, reviewing and/or converting to many different formats, such as MS PowerPoint, PDF file, MS Visio, and many other graphic ones from the ConceptDraw Solution Park or ConceptDraw STORE. The Security and Access Plans solution is available to all ConceptDraw DIAGRAM users to get installed and used while working in the ConceptDraw DIAGRAM diagramming and drawing software. This diagram was created in ConceptDraw DIAGRAM using the Alarm and Access Control Library from the Security and Access Plans Solution. An experienced user spent 15 minutes creating this sample. According to the established fire safety standards and rules, the smoke detectors must be obligatorily installed in any building and premise, no matter it is residential or commercial, or industrial. The smoke detectors react on the smoke in a premise's air with a sound signal and transmit an alarm signal to the central fire alarm panel, the speed of reaction depends from the detector's sensitivity, typically they have good sensitivity and react even on the small amount of smoke. It is recommended to treat seriously to the planning of the smoke detectors installation, especially if we are talking about a large building. The ConceptDraw's Security and Access Plans solution provides you with a vast array of objects to map out your own security plans and access plans. Not only the smoke alarms, but also the gas detectors, cameras, panic buttons, and many more options are included. Of course, ConceptDraw DIAGRAM software makes it easy to conceptualize the building layout too. This diagram was created in ConceptDraw DIAGRAM using the Video Surveillance Library from the Security and Access Plans Solution. An experienced user spent 20 minutes creating this sample. This sample shows a few more features of the Security and Access Plans solution, like highlighting a security camera's angle and scope. It is a CCTV (Closed-circuit television) System Plan depicting the layout of video surveillance equipment. The video cameras that you see in quantity are used to transmit the signals on the limited set of monitors. Thanks to the offered program's ability to rotate the objects, you can show the direction of the cameras' location directly on the plan, to think it over so that all they cover the entire space. The CCTV systems are in demand in many institutions, they can operate continuously or be set on the monitoring a certain event, but in any case their installation must be carried out in accordance with the law. The use of ConceptDraw DIAGRAM software lets you create the relevant and professional looking video surveillance CCTV system plans, security plans, and access schemes. This diagram was created in ConceptDraw DIAGRAM using the Alarm and Access Control Library from the Security and Access Plans Solution. An experienced user spent 10 minutes creating this sample. This bright sample illustrates the camera layout schematic at the airport, their viewing angles are different and catch the main areas. The viewing angle is one of the main criteria when choosing a video surveillance camera, because it determines the area of observation controlled by it. This angle depends on the focal length of the camera's lens and the size of its matrix. At the equal focal length, a video camera with a larger matrix will have a larger angle of view, it is important to consider when choosing the video surveillance equipment, in particular the CCTV cameras. The areas of observation are differently highlighted on a given plan and sometimes intersect. This method gives the plan more brightness and clarity. Make your own camera layout chart with Security and Access Plans Solution in just minutes. Use the predesigned templates, samples and libraries with a large amount of ready-made vector stencils. This diagram was created in ConceptDraw DIAGRAM using the Alarm and Access Control Library from the Security and Access Plans Solution and Trees and Plants Library from the Site Plans Solution. An experienced user spent 20 minutes creating this sample. 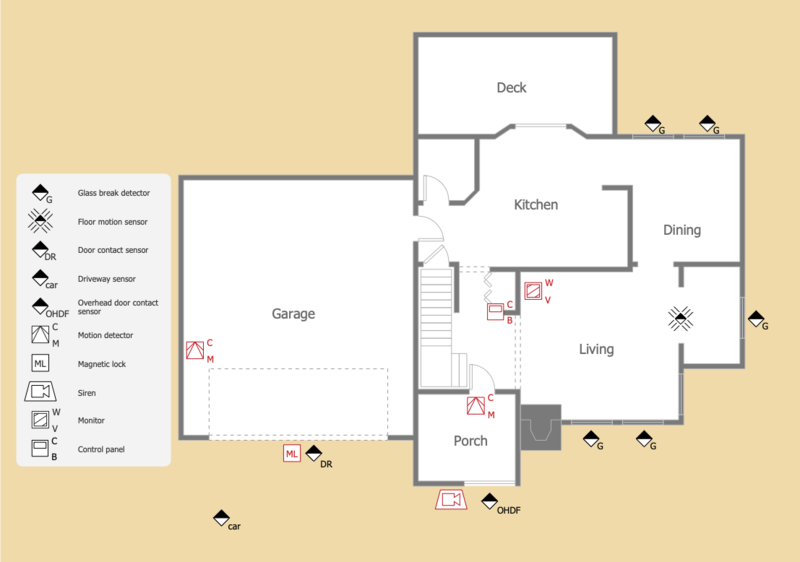 This sample shows a security system on the house floor plan. It was designed on the base of the security system floor plan published on the website of the California State University. The different detectors are installed everywhere in the home including not only the living spaces, but also the garage and service room. The legend for the security system hardware contains all symbols that were used on the plan, along with their descriptions. Here can be found such devices as the distribution panel, window-door contact, sonic detector, key pads, heat detectors and smoke detectors. There are two heat and two smoke detectors on the plan, which will be installed in different parts of the home, and only one distribution panel is required. Any security chart or access chart designed in ConceptDraw DIAGRAM software with help of the Security and Access Plans Solution is ideal for presentations, conferences, and reports. Use the ConceptDraw DIAGRAM to achieve great success. This diagram was created in ConceptDraw DIAGRAM using the Video Surveillance and Alarm and Access Control Libraries from the Security and Access Plans Solution. An experienced user spent 15 minutes creating this sample. This sample shows a physical security plan developed for a private home. A security alarm is often installed in homes, offices, banks, and other buildings. It is a system which provides security, lets detect the unauthorized intrusions to the guarded territories, in buildings and vehicles, to protect the property against the thefts and damages, as well as to guard people being inside. Before you begin assembling a security system, strive to draw a plan. This will allow you to avoid mistakes that can require serious changes and reinstalling your equipment. The security alarm system installed in this home is extensive and includes several glass break detectors, the floor motion sensor, door contact sensor, driveway sensor, overhead door contact sensor, motion detectors, magnetic lock, siren, control panel and monitor. The places of location of all devices are well thought-out. The added legend allows making this scheme understandable for all stakeholders. Both ConceptDraw DIAGRAM diagramming and drawing software and the Security and Access Plans solution can help creating the floor plans you need. The Security and Access Plans solution can be found in the Building Plans area of ConceptDraw STORE application that can be downloaded from this site. Make sure that both ConceptDraw DIAGRAM and ConceptDraw STORE applications are installed on your computer before you get started. After ConceptDraw STORE and ConceptDraw DIAGRAM are downloaded and installed, you can install the Security and Access Plans solution from the ConceptDraw STORE.